I had the privilege of traveling with Angolan biologist Pedro Vaz Pinto last week as he visited natural history museums from Washington, DC to Cambridge, Massachusetts. Stops included the Smithsonian, the American Museum of Natural History, Yale Peabody, and Harvard’s Museum of Comparative Zoology. His mission? To obtain snippets of skin and tissue from ultra-scarce specimens of Hippotragus niger variani, the giant sable antelope of Angola. Handsome and sleek as show ponies, the common sable subspecies seen in Botswana, Zambia, and South Africa makes visitors on game-viewing safaris reach for their cameras. But they pale in comparison to the majestic giant sable, found only in Angola, and an icon there. The coal-black males, which carry scimitar-shaped horns over five feet in length, are featured on the country’s currency and the tailfins of its airline. Even the national soccer team is named after the antelopes—which also happen to be one of Africa’s most endangered mammals. Vaz Pinto estimates that only a hundred of these walking emblems remain. On a daringly ambitious 2009 expedition into the remote Luando Reserve, Vaz Pinto managed to pull off a conservation coup and locate the remnants of a population long feared a casualty of Angola’s 27-year-long civil war. He went on to dart and relocate a giant sable bull and nine females to start a captive breeding program in nearby Cangandala National Park. 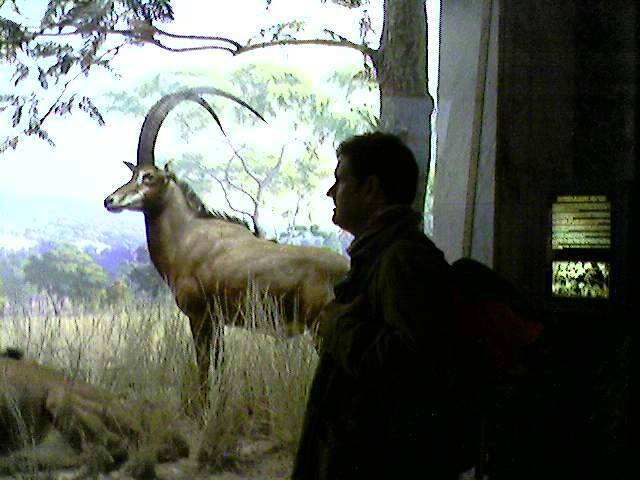 (Read my two-part Africa Geographic article on the expedition, “Antelope From the Ashes”– click here for Part I and Part II). So far, the protected herd there, bolstered in number by subsequent translocations, has produced five calves this year. But Vaz Pinto is all too aware that field work, not matter how impressive, isn’t enough to ensure the giant sable’s future. He’s in a race against time, against bush-meat poaching, against inadequate resources for the nation’s parks and reserves. For the past decade, he’s cajoled officials and the military for support, and local oil companies, like Exxon-Mobil, for funds. Now he needs more attention from the zoological community. In the past, the taxonomic status of Angola’s legendary antelope was clouded by doubts that it was anything more than a large local variant of the unendangered common sable. Recent DNA research has confirmed the giant sable’s subspecies status, but Vaz Pinto wants to go a step further. He’s doing doctoral research in the CIBIO lab at Oporto University, Portugal. “We expect to sequence the entire giant sable genome next year,” he says. Such detailed genetic information would provide critical help in guiding the captive breeding program currently underway. And it also would underscore the giant sable’s stature, hopefully spurring an international push for the conservation it desperately needs. Vaz Pinto needs samples of historic giant sable material he can analyze. But requests for even tiny snips of skin aren’t treated lightly by museums. It amounts to destructive sampling of a limited supply of specimens. Fortunately, the conservation implications of his ground-breaking laboratory research seem to be overcoming institutional scruples. So far, he’s receiving strong encouragement for his next achievement on behalf of Angola’s national animal.